The “hedonic treadmill” is an economic term describing our tendency to quickly grow bored with the new shiny and continuously look for the next big, flashy, must have item. I had a conversation with one of my online players the other day that pushed my thoughts in this direction. The gist of the conversation was his feeling that 4th edition was kind of dead, as it had been several years since the switch from 3rd edition, essentials had come and gone, and the dialogue on the forums seemed kind of limp. I think in reflecting, I had also been feeling a sort of malaise of late, in part it seemed from buying into the hype machine and gobbling up each new release, article, and post topics that a letdown seemed almost inevitable. I in a sense was chasing a D&D high. I also feel that part of my jet-lag was due to the Essentials line; despite liking the content it kind of cheesed me off as it really seems like Wizards is calling a big do-over. I felt tired of thinning content spread out into multiple books geared to generate more income, needing to update monsters if I wanted to use any earlier modules or materials, online character builder debacles, and a perceived lack of content support for campaign settings and decent modules. It then came to me that I had lost my way and in fact stumbled upon the hedonic treadmill, bamboozled by Wizards marketing and my vulnerability to pretty shinny things. What do you really need to play and enjoy D&D? I know I have mentioned this before, I am friggin grognard so cut me some slack, but in years past we played endless campaigns with such little overall content and in the case of Runequest only one book. We were happy doing it too, not feeling like we were lacking or missing out on anything. I think my D&D needs a little more of this, so I put down the multiple rulebooks I was reading and pulled out a Fantasy novel. Instead of thinking about new builds or feats, my mind drifted to possible campaign story arcs and NPC’s, and I am pretty sure Steven Erikson and my players won’t mind if I shamelessly plunder his world for a good cause. I have often written in the past about my typical default character in 4th edition (when I actually get to play) is either a defender or a leader given that there is rarely a shortage of strikers at the game table. This is understandable as the strikers have become the glitterati of the D&D world, where massive damage and eviscerating enemies in one shot has driven the rogue and ranger to Brangelina status. That’s fine; let them have their sparkling mountains of damage dice. If the strikers are the glitterati, then the defenders are the everyman, and as John Lennon once sang “a working class hero is something to be”. I thought I would make this post about how I embrace the defender role, so “if you want to be a hero, well just follow me”. The mindset I have gotten into when I create and play a defender is that I will be the rock that my enemies break themselves against. For this I favor the straight up sword and board fighter. As for race, I have dabbled with a few, but have settled on the Dwarf for a few reasons. Firstly, there are few things as iconic and rock like as a Dwarven fighter, and secondly being able to use your second wind as a minor action is sublime for a guy that is planning on getting kicked in the nads a lot. Oh and being able to resist a square of forced movement is uber rock like as well. When I craft the rock I take a three prong approach of jacked up defenses, self-healing (let the leaders save their healing for the squishy prima donna strikers), and punishing those that disobey my mark. There is nothing like seeing the look of frustration bordering on madness in the DM’s eyes when he can’t hit me, and he has to try cause god knows I’ve marked just about everyone I can see; and if he does hit me he can’t drop me because I soak up the damage like a sponge; and then he can’t move his bad guys around the field like he wants to because they are stuck to me like glue. That look of madness in his eyes makes me as giddy as a school girl. 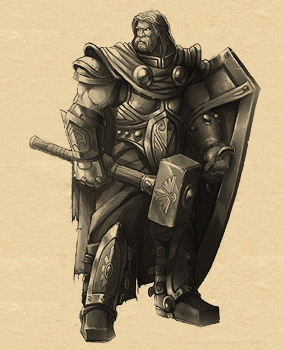 My current defender incarnation is Markus Laggerbelly, a Craghammer wielding Dwarven fighter. I play him as a sarcastic and wise-cracking (it’s funny how art imitates life 😉 ) nut job that launches himself maniacally into the fray with reckless abandon. He constantly taunts the enemies to come get a taste. His response to getting pummeled is a lot of 3 Stooges dialogue. For me, in 4th edition, I think the key to playing a defender is embracing the masochism. How about you guys, how do you play the working class hero? Well ‘tis the season to embrace wanton tinseled covered commercialism so we can keep our economy grinding forward. Every year around this time Mrs. Middle-Aged DM begins to poke and prod me with a candy cane to cough up gift ideas that she and other family members can “surprise” me with, so I thought I would turn it into a blog post for us hard to buy for geeks. Making a gift list has always been a difficult task for me, as I am a bit of an impulse shopper. Picture a small child with a hose and that would be me with my debit card. So when my wife inevitably corners me and starts asking what I want for Christmas (usually as I am trying to nonchalantly hide or dispose of evidence of a recent nerd purchase which could have gone on said list) I often mumble that I need to think about it and get back to her. One year I even returned something I bought so I could then offer it as a gift suggestion. Here is my wish list for this year, although just compiling it has started me jonesing big time, followed by involuntary hand movements toward my wallet…..Christmas better get here soon. I have heard really good reviews around this game, plus I get giddy thinking about bamboozling someone who is anti-D&D into sort of playing D&D through the guise of a board game. Besides you want to talk real vampires, Strahd would eat Edward for breakfast. For us Grognards out there. For those of us that miss having an actual physical copy of Dragon Magazine, you know for the long mornings in “the office”. This is a highly regarded magazine put out by the former editor of Dungeon and Dragon magazines Wolfgang Baur. It offers content for both 4e and 3.5/Pathfinder, and you can get print plus pdf or just pdf. 4 varieties of one of D&D’s most iconic monster just waiting to be thrown at unsuspecting players…nuff said. This is a “super-adventure” for the paragon tier of play. I have heard mixed reviews regarding the writing and design of the module, but I am thinking of using it as a skeleton for aspects of my home game if I can hold the campaign together that long. Here is a list of products that would have been on my wish list if I had not already purchased them: The Monster Vault, Pathfinder Core Rule Books (47% of cover price through Amazon.ca), Heroes of the Forgotten Kingdoms, Heroes of the Fallen lands, Dungeon’s Master Kit, Rules Compendium, Red Box (go ahead initiate a newb). So there I was staring down the barrel at a total party kill. I had one player already shed his mortal coil and was frolikicing in the waves of the Astral Sea; two others were making death saves with a few strikes against them, and a lone fighter with one reaming Hit Point was going toe to toe with the Kobald Wyrmpriest. It was the Wyrmpriest’s turn to act, I said “he lunges at you with his dagger, while cursing your family lineage” and let the d20 drop from my hand watching it spin to a stop on the 20….. “does a 14 hit your AC?” I already knew the answer. The rest of the fight was a blur as the fighter cut down the Kobald with the aid of the ranger who miraculously rolled a 20 on his death save allowing him to basically resurrect himself. If this was my home game where I roll the dice without a screen, this wouldn’t have been an issue as it would have been a complete bloodbath, but this was my online game where I find it easier to just roll the dice instead of creating macros for maptools. So I had the option to fudge the dice, and when push came to shove I did. The question is why did I do it? This has required some introspection on my part. I don’t’ think it was to prevent hurt feelings or upset by the players, as we were having a really good time laughing and joking, no one was getting bent out of shape about what was happening. I think when it came down to it I just didn’t have it in me, but I don’t think it was a fear of being a Killer DM or being uncomfortable with my unconscious aggression and blood lust ;). 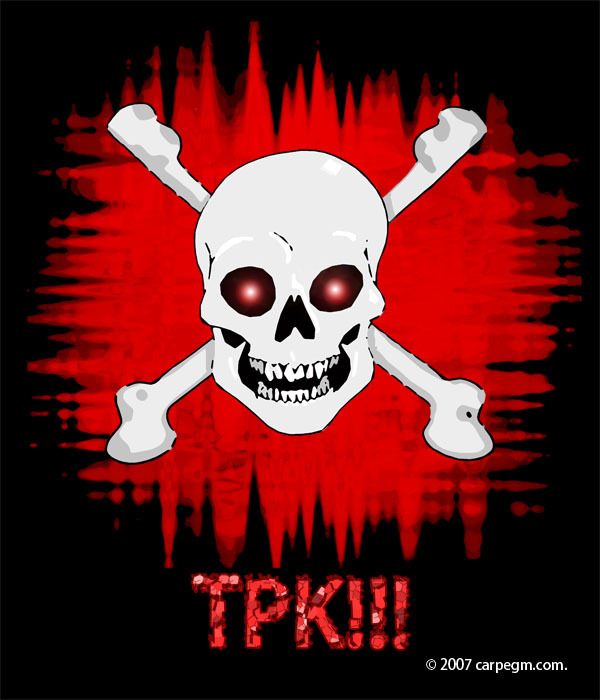 I think I just didn’t want to have to deal with the ramifications of the tpk, like creating new characters, re-starting the story or the having to hand-wave everything, this just seemed easier. It did make for an a epic tale as I know the ranger felt like he was full of awesome when he rose from the dead and put an arrow through the Kobald’s eye. In hindsight, if I had to do it again or if the opportunity presents itself in the future, I think I would just let the hammer fall, unless it really turns out that underneath it all I am just a big softy…god what’s next finding out I like romantic comedies.